I'd like to continue to place some information extracted from my manga-drawing book I'm writing now. I'll show some part of manga story-creating in this page. When we create magna, we need to create a plot as well as character sheets. Some manga-learners try to create very long stories even though they haven't get enough skills yet to do so. Before working on such voluminous work, it's very important to acquire basic techniques by creating short manga between 16 pages and 50 pages. Especially for beginners, I'd recommend to draw 16 or 24 pages, and it seems that 32 pages manga is the most common unit for manga-learners. Plot is a storyline of a manga. We usually type or write on around B5 sized paper. When manga artists have a meeting with editors, we show plots and character sheetts. Since plots are outlines of the stories, we don't write characters' speeches or detailed descriptions in them. However, if they are too small in amount, we can't make the editors understood enough how the story goes concretely. Thereby, I write around one page for 16 pages of manga, two pages for 32 pages of manga, and three pages for 40 pages of manga. In some publishers, the editors omit the first stage of discussion on plots and character charts and begin with the next step, called *name in Japanese manga industory, though. *If you want to know what the "name" is. please check MANGA-CREATION. I'm often asked ,"Do I have to think of plots first, or characters?" The answer is, "Either will do." You can start manga-creation by thinking of anything related to the manga. It's OK as long as the plot and the character sheets will be completed. Therefore whether you think of some character first, or come up with either of some scene in the story or the set-up of the story first, there wouldn't be any problem. Then, let's begin with basic knowledge of plot called "5W". You should put 5W factors at the beginning of the plot. The 5W factors are as in the followings. Let me show you an example of texts which include 5W factors. The beginning of the plot is like this. "On May 2018(when), Naomi Ito, who is a student of Tama Art university(who) is painting a picture(what) at a riverbank of the Tama river(where). This is because she is going to submit her work to an art competition called Nika-ten and win the prize. (why)"
As you can see, it's easy to understand the situation of the story if 5w factors are put at the beginning of plots. Would-be manga authors should always pay attention whether their plots are understandable or not. Basically, we consider that the story of short comic strips/short manga is composed of a series of happenings. Usually we don't count very small things, such as characters' glancing at a clock or their yawning, etc., as happenings. They are only happenings in a flash. We count only impressive and important occurences to some extent as happenings. When we write plots, we especially pay attention to the basic rule called "Ki-Shou-Ten-Ketu". 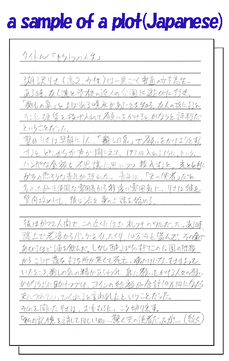 The story of Japanese manga around 16~60 pages consists of these four parts. So, when you create plots you should be conscious of each part's important role. Ki: Ki is the beginning part of the story, so, you should put 5W factors into this part and let the readers understand the starting situation of the story. In addition, it's important to place a happening which would attract reader's interest and make them feel like continuing to read the manga. Shou: Shou is the part in which the story develops towards the climax. This is the longest part among the four. It would be desirable to put some short scenes or happenings which would make the main character and other important characters look attractive. Because if the readers are not charmed by the characters, they won't be so excited even when the story reaches the climax. Ten: Ten is the climax. If it is a fighting story, the main character would fight and defeat the enemy here, and if it's a love story, the main character would confess his or her love. Usually, the most impressive happening among the whole story should be placed here. 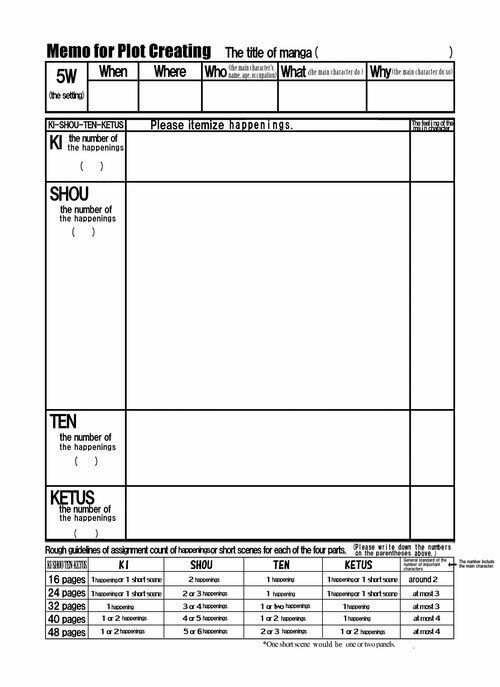 Ketus: Ketus is the last scene or the last happening of the story. This part has influence on the readers' feelings very much who have just finished reading the manga, so, it would be better to think over carefully when you create this part. If you want to win a manga prize in Japan, you need to be well aware of Ki-Shou-Ten-Ketus when you create a plot. After you get the knowledge of basics of creating plots, let's learn briefly concrete ways of creating them. I'll introduce three of them as references. Method 1: The first way is to think of the main character's aim and add something which would disturb its accomplishment. For example, if the main character's aim is to win in some tennis meeting, you should add something disturbing, such as injuries while practicing, some powerful rival's moving into the prefecture, etc., and then, consider how the main character overcomes them to achieve the aim. You might feel it hard to think of good ideas to get over the difficulties, but this is the chance for you to show your good ability. This method is the most basic and has wide applications, so, you can use this in various genres. Method 2: The second one is called " three words story" in Japan. This is a method to prepare three words and create a story using them. For example, if you prepare three words " bird, stairs, medicine", you create a plot using these words. Three words should be chosen as randomly as possible. For example, you can turn up a dictionary three times when your eyes are closed, or, you can write various words on small pieces of paper, turn them upside down, scatter them on a table and choose three of them at random. Unexpected combinations of words sometimes bring about unique plots accidentally. Method 3: The third one is to extract a "framework" from some ready-made story. For example, you can extract a framework from "The Ugly Duckling" as follows.
" Some inferior main character who had been made fun of by everyone for a long time turned out to be an excellent person." You can create new story based on this framework. I just cited three methods, and it's OK for you to think of other methods. Here are rough guidelines of assignment count of happenings or short scenes for each of the four parts. Then, you have learned the basics of plot-creating, so, let's create a plot! I have created a format to help you create it. You can organize your ideas before you work on it using this. Please click the chart to enlarge it. Q 1: I still don't understand what it is like to "grasp characters' personalities". A: It is to understand the characters as much as you understand your close friends, your family, anybody whose personalities you know well. If something happens to someone close to you, it would be easy for you to guess his or her reaction, right? For example, "If my mother wins 1 billion yen, she would fall over with too much excitement and as soon as she regains consciousness, she would be absorbed in shopping at luxury brand clothing stores." When you grasp your characters' personalities, you can easily guess their reactions to various happenings like these examples. This is it." Fortunately, this answer seems to satisfy almost all students. Q 2 :　What is a typical weak point of amateur story teller's plots or characters? A: I've read hundreds of plots written by would-be manga authors, and the most striking drawback is "a lack of originality". As far as beginners are concerned, it would not be bad to have similarity with other manga to some degree when they draw manga as practice. If their works are rather similar to ready-made ones, it would be OK as long as they are not shown publicly. However if you are would-be manga authors who are at intermediate or advanced level, you need to know that originality is inevitable to become professionals. In many cases, they are highly influenced by other famous manga. I can see many similarities in setting, happenings, characters' personalities and appearances. A lack of originality is one of the biggest factors which prevents you from becoming a professional. Of course even famous works are affected by other works to some extent, but not so much as to be called "rehashes" or "medleys of other famous works". This is because its originality surpasses its similarity. In order to lessen the impressions of similarity with other works, try not to imitate the unique settings, the important items, the main characters' characteristics, the important happenings especially the ones at climax. Why similarity is so damaging? This is because human beings lose interest when they face similar things multiple times. This tendency is especially remarkable among young people while elderly people tend to feel comfortable when similar things are repeated around them. Therefore, works for young people like manga, especially need to have attractive originality in many aspects. Please try to bring original ideas into your manga. You can put them in settings, items, characters' characteristics, happenings, words, etc., almost everywhere in your works. Q 3 : When I'm creating plots, I get at a standstill many times because I can't think of good ideas. What should I do? A: To tell the truth, professional manga artists often face the same situation. What do you think they do then? They will continue to consider until they get good ideas. As a matter of fact, getting at a standstill is a hopeful sign. When you get stuck in creating ideas, you should consider more than when you are not at a standstill, and as a result, this will bring about much better ideas. It's regrettable to give up thinking without knowing this. In creating something, you often face such kind of standstills. But if you get bright ideas after you continue to consider patiently, you will feel very happy so much as to forget the birth pangs you had been suffering from. In many cases such creations get popularity. Having both pain and delight is the true nature of creative activities.